When it comes to electric cars, all the talk is about Tesla (TSLA - Get Report) . When it comes to autonomous driving, it's all about Nvidia (NVDA - Get Report) and Alphabet's (GOOGL - Get Report) (GOOG - Get Report) Waymo. When it comes to autonomous motorcycles, we all rave about... BMW? The autonomous motorcycle concept isn't something many are familiar with, and to be clear we don't expect to see a self-driving motorcycle anytime soon. But the team BMW (BMWYY has put together one that is capable of doing just that. The team was quick to point out that BMW doesn't plan on putting the two-wheeled robo-driver up for sale or producing them for customers. It's just another way that BMW is looking to push the envelope as various technologies continue to engulf the transportation industry. While all the talk is about Audi and Mercedes (DDAIF catching up to Tesla or how autonomous driving is taking over the roads faster than many drivers realize, BMW isn't looking to play catch up -- it's looking to lead the way. Earlier this month we saw Mercedes introduce its all-electric EQC SUV and Audi introduce its E-tron. Both models are expected in 2019, with the specs about in-line with or slightly inferior to the base Model X from Tesla. 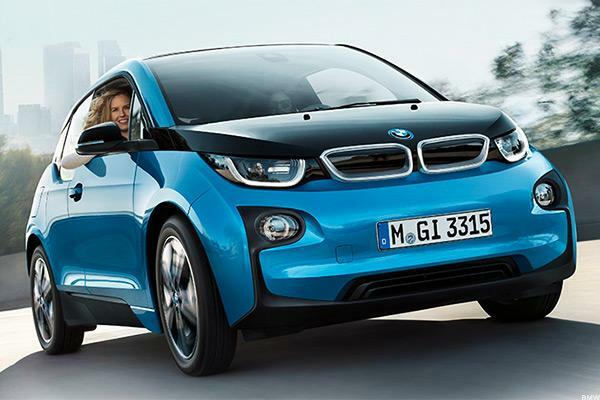 BMW has made a push into the electric and hybrid game with its i3 and i8 models. However, drivers of these cars must be buying for the looks, because their price tags are anything but cheap while the specs are unimpressive purely from an electric vehicle (EV) standpoint. That's not a knock on BMW, as its push into the space is commendable. While the iX3 SUV -- which BMW began taking pre-orders for earlier this month and plans to debut in 2020 -- sports better specs and a longer range, it will have more to worry about than just Tesla eating its lunch if it doesn't live up to the vehicles from its German competition. In a few years, everyone from Mercedes, Audi, Porsche, General Motors (GM - Get Report) and others will have EV offerings. If that's what customers want, BMW may lose customers to its main rivals if it doesn't keep pace. 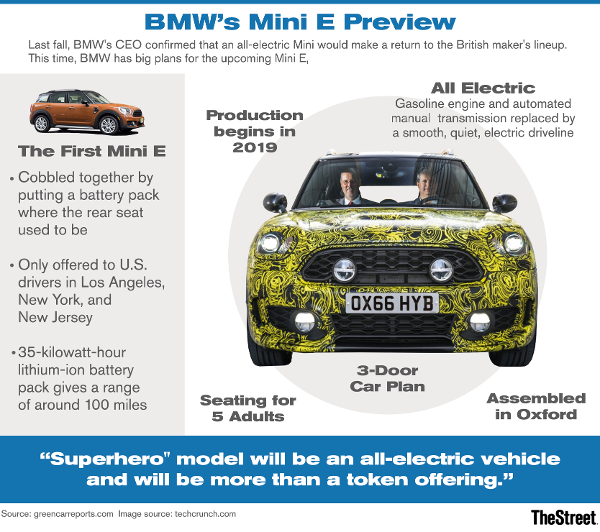 That said, BMW said earlier this year that it will take a "modular" approach to EVs and hybrids, allowing its vehicles to essentially look the same, but accommodate electrification alterations. It plans to have 12 EVs and 13 hybrids on the road by 2025. That's a big commitment and solid sign that BMW plans to be ahead of the curve, rather than behind it. BMW's autonomous motorcycle is a cool headline, but it's not a realistic vehicle in the intermediate future. However, it shows what BMW's tech team and engineers are doing in the factory. Like Mercedes, Audi and countless other competitors, BMW will eventually push autonomous driving features into its new vehicles. As cars go from adaptive cruise control and lane assist features, they will eventually have more capability down the road. With Audi's new A8, we're seeing some of the most advanced driverless technology on the road in the form of a consumer vehicle. Tesla's Autopilot (which continues to improve with over-the-air updates) is often talked about, while GM has its Cruise acquisition, and Mercedes is rarely left out of the conversation. BMW is left from the conversation, though. Like electrification, I would expect that to change going forward, particularly as the technology advances. The automaker recently announced its Intelligent Personal Assistant, an AI-powered infotainment system for its vehicles. The automaker told TheStreet it's not yet disclosing what platform it's building the assistant on. However, it's reminiscent of Mercedes' partnership with Nvidia to build its MBUX AI-powered infotainment system. The fact that BMW is getting in the game isn't a surprise, and I would expect other automakers to jump on board as well. BMW taking advantage of AI solutions tells us the company is embracing new technology and that should mean BMW will further its autonomous efforts going forward. The question will be, can it stack up not only to its German competition, but to global competition as well? If past performance is any indication, BMW will be just fine.